Jill: We have in our studios today a multi instrumentalist. His name is David Cohen, and David welcome to Crossover. David, I don’t even know how to categorize you except that you play so many different instruments and you have such fascinating stories to tell, that I guess we should start talking. Jill: Now which was your first instrument? Jill: Where you musical at all? Did you play anything? Jill: Now a little bit, it’s fascinating you are a very interesting person because you’ve had a checkered career because you’ve supported yourself as a baker and pastry chef to support yourself while you were studying but was that your craft to begin with? David: It was what I thought I was going to do because music was always a very very serious hobby to me. It was always important to me. Jill: But you never studied to be a professional musician? David: I studied for my own enjoyment, and I was always serious and have had amazing teachers I’ve been very lucky to have the teachers that I’ve had in my life and that’s why I’ve ended up doing what I do now. Jill: Which is of course a lot of teaching and freelance playing. Jill: Also you have a web site that is rather fascinating as well. Which is PhiladelphiaClassicalMusic.com. What does that have on it? David: Well, I had gotten to the point where I realized there was so little promotion of classical music in Philadelphia and especially for us independent small time guys and gals. Jill: You’re talking about freelancers and the people who really play the jobs? David: Initially the site started out to be a calendar of all the classical music in the city, of anybody, any classical organization, and world music. If I didn’t have that it would leave out a lot my gigs. Anybody, any organization, e-mail me your events and I will put them on my calendar. That’s how it started. Then I went into slowly interviewing people. It was suppose to be local but it went huge and now I interview a lot of major performers as well as us local guys. So it turned into a comprehensive site with interviews, features, news and the calendar. Jill: But you are also a very very active player, isn’t that right? Jill: When I first started talking to you, I had gotten some information about you. I was fascinated because you play flamenco guitar and that’s something also that is a specified kind of technique and repertoire, which is something you really have to learn to play by playing in the groups. Is that right? David: Yes, you really can’t learn this from books. You have to have somebody show you. Jill: So what happened? How did that start? You started with the guitar because you loved it and you were studying classical guitar? David: Right, what happened, I had no experience with music, and like I said earlier, I heard Joan Armatrading playing the guitar and that made me want to learn the guitar. I was playing a recording of hers and somebody said she plays like a classical guitarist. So that’s what I wanted to learn. Then the person said she has bass lines like Bach. Jill: And said that’s what you want to learn. David: Well, it goes back years but I went to a place called Glass Music -I think it was called that, at 13th & Chestnut. Jill: You mean here in Philadelphia? David: Yes, in Philadelphia. I went there and said. “I want to play classical guitar and I want music by Bach”. So they gave me a bunch of stuff and I went home to read it, I taught myself to read music. Jill: Well, you taught yourself to read but how did you teach yourself how to play the guitar? David: I didn’t, that’s when I realized I needed a teacher. David: I taught myself to read music and then I found an amazing teacher, Philip Romeo in South Philadelphia. Brilliant musician! Jill: And you started to play classical music. David: I started to learn it. It took me a long time before I was able to play it but I started to learn the techniques. Jill: But where did the flamenco come in? David: The flamenco came in, what happened was I realized, and that after years of playing, when I write I have no root from where it comes from. I needed something to base my music from. Jill: Some kind of folk root? David: That I can root what I want to create. Flamenco was it. Jill: Do you compose at all? David: I do write a lot of my own stuff. Jill: In other words you started as a novice. You didn’t go music school particularly. You just said that is what I want to do and how do I start, and just went to a music store and find out what it’s about and find a teacher. What age was this? David: Oh man, that’s tough, it’s gonna give away my age. It was in 1976 when I started all of this. Jill: So you were young, a young man. And yet, many times when you speak to musicians who say I always wanted to play there was always music in the house and the mother got me a teacher, but you started as an adult. David: I was a teenager. I thought I was an adult. Jill: How did you develop the flamenco technique? David: Absolutely, this isn’t something you can learn without lessons. Jill: The lessons are by ear? David: Yes, It’s not written. It’s by ear and a lot of repetition. Jill: Why don’t you play us something? Jill: Where do you play this kind of thing? Do you play in recital? Are there jobs you play where people are asking for flamenco guitarists? What’s the market for this? David: I play wherever they will pay me, whatever the occasion is. 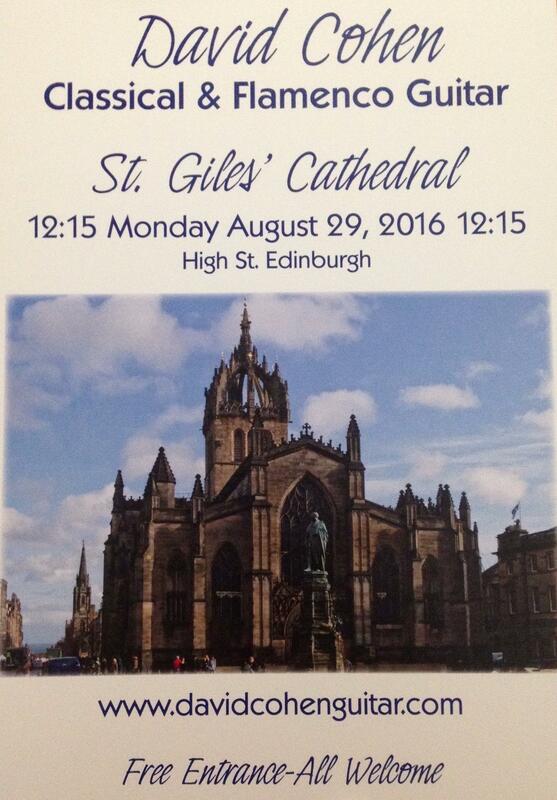 I do recitals; I do a lot of wedding. Jill: But is there a call for flamenco guitar? David: Yeah! I should say no so people won’t get interested in it. I do have a little job security. I find there’s a lot of call. Jill: What I mean is, it’s very odd, somebody would say I want flamenco music. It’s kind of…… a scene. David: It could be that way with all of these instruments. When I started with the pipa it was just something to have for myself not to make money off of because it wasn’t expected. I didn’t think I would make money off it, but I was in a position where I was trying to get a job and I needed something that would push me over the top so I told them that I play the pipa. It turned out the people really wanted a pipa player but never thought they would find one. Jill: You now must tell our audience because the pipa has become relatively popular. It’s in the stringed instrument family, like but not like a guitar but the same principle I think with a very specific technique and a repertoire that is very specific. David: Yeah, it’s Chinese, it’s very specific. Jill: When you play the pipa do you play for events? And you play for Chinese events? David: I play for, again I’ll play wherever they pay me to play. I do a lot of Asian wedding, not just Chinese. I also play a lot wedding in general. A lot of people like the music and a lot of times I’m hired for wedding, it’s people who want unique quality music that isn’t ..
Jill: Can you play something? All of David’s experiences are so fascinating in terms of how he has gotten involved along he way. He is kind of a traveling musician I would say and he takes his beautiful instruments with him. This pipa is a beautiful looking instrument. How many strings? David: It has four strings tuned to A-D-E-A. Jill: And the repertoire you have to learn with a master? David: Well, yeah if you want to be good. When I pick up any instrument I want to be authentic on it. Jill: Well I know for instance, I interviewed Wu Man when she was here. She had a piece written for her by Lou Harrison who is an American composer and we do play on the station a piece called Yellow River Concerto which is a kind of westernized Chinese version of a rather impressive piano concerto with an impressive pipa part in it and I must say I don’t think any of us knew about the pipa until we started playing that concerto so it’s rather odd to find you, a Philadelphia born musician and accomplished pipa musician. David: After I got my pipa and I was looking all over for a teacher, I even called the Chinese video store asking if they knew of a pipa player here. They even said, No pipa player in Philadelphia, you go to New York. When I found a place in New York, I don’t think they took me serious at first, a Jewish boy from Philadelphia. Eventually they did. David: Yes, that was for a piece called Melody of the Elite, the only indication of a note is in the beginning of the piece they’ll have 1=C so we know it’s in the key of C. The rest is numerical for the tones in the scale. So if I was going to play C-D-E it would be 1-2-3. There are indications in the music for octaves and techniques. Jill: It’s very evident, five tone scale. How do they define the rhythm? David: It’s interesting, they do it by lines over the tone. If it’s an 1/8 they have one line. Jill: So they don’t use notes? David: No, it’s numerical. It looks like math. Jill: In sheet music they have a box over the music for the chord is it like that? Jill: Oh I see, they don’t write out the melody. David: It’s interesting. I do a lot of simple pipa pieces with my guitar students. When I give them the music in Chinese notation they pick it up faster and when I give them the same piece in our notation, they will have trouble with it. Jill: The technique is similar to the technique on the guitar? David: It’s the same exact technique but in the opposite direction. Jill: Now, Here’s another instrument David plays and I have to keep from smiling because he’s literally a one man band although you would never put all these instruments together in a band. What’s fascinating is his love of what he wants to do and his accomplishment in learning these instruments. Now, just play something and we’ll see if our audience recognizes what you’re doing. Jill: That really quite fascinating and certainly a departure from any stringed instrument that is fretted. How and why did you get involved in this? David: I love the bagpipes! I heard Rufus Harley years and years ago. Even before I picked up the guitar I wanted to play the bagpipes. I love the bagpipes, and I always wanted to play them. It got to the point where I had to learn them. David: Yes, The Pipes & Drums of the Jersey Shore Shillelagh’s. Jill: When do they usually play? David: We practice every Tuesday night and now during parade season we also practice on Sundays. The band plays for a lot of charity events, the band marches in a lot of parades-the Belmar Parade! 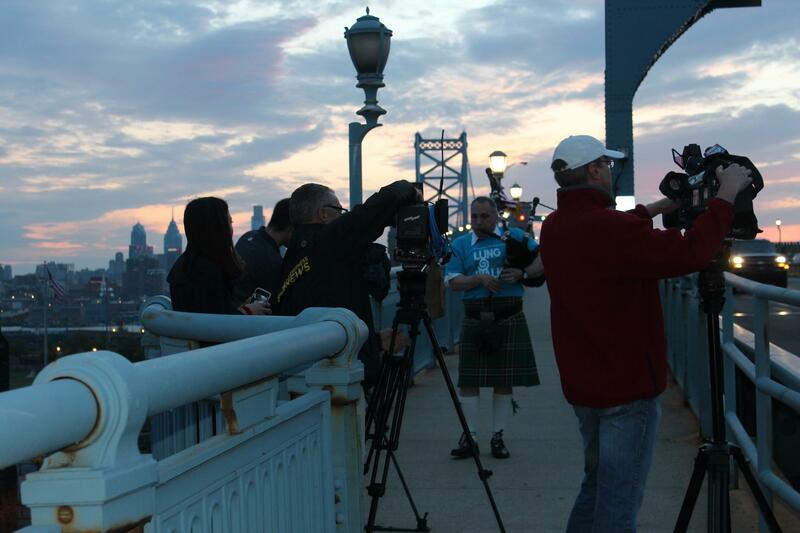 David Cohen captured by CBS 3 News after crossing the Ben Franklin Bridge playing his bagpipes to kick off Women's Lung Health Week with the American Lung Association.